Ready-made is all well and good, but in this day and age of customisation, we need to stay ahead of the pack. So, here’s our list of some of the most affordable cloth markets in Delhi to find fab cloth and dress material for those DIY days. Everyone has heard of HP Singh; (at least everyone who’s getting married or having babies, or just likes shopping). But there’s more to Nehru Place than just that. The stores here have direct mill-access, so you can expect wholesale prices for handloom and cotton material. You’ll also find silk, linen, net, crepe and georgette in a variety of hues and prints. They generally have fixed prices, but you can ask for a discount when buying in bulk, making this one of the cheapest cloth markets in Delhi. The largest market for salwars and kameez in Asia, Central Market in Lajpat Nagar is the place for all your cloth needs. Most of the cheap cloth markets here retail similar stuff, so you’ll need to wander around and do a lot of digging. Or you can try our guide here. This is the best place to bargain and get amazing deals on that expensive net or zardosi work. College students know the ins and outs of Mohan Singh Place and we will tell you why. This is the cloth place in town where you can buy fabric for cheap, which can be then tailored to perfection at a quarter of the cost of what other branded places charge. Mohan Singh market is a legend amongst all those trying to save money while keeping up with the latest fashion. Fabric shopping in Jwalaheri makes for quite the outing on Saturday mornings. The place stocks all kinds of fabric at dirt cheap prices, with the option of bargaining further. We love the suiting and shirting options for men here, as well as the jeans (that you can get tailored). There are a few dyeing shops here too, which charge very nominal rates. The market also has a number of lace shops. The most recognisable of the lot, Shankar Market is easily identified by its walls full of street art and murals. With about 15 lanes that lead to little openings full of cheap cloth shops, you will find heavy brocades, gauzy chiffons, cotton, polyester and everything from hand embroidery to intricate machine work. The prices might seem a little steeper than other places, but building a solid rapport with the storekeepers will go a long way. We love the prints and variety here, so don’t miss out. The state-funded emporiums near CP are known for promoting cottage and rural industries, so you’ll find a wide variety of handloom and traditional weaves here. Hand embroidery like Kantha, silks from down south and reams of fabric from West Bengal (Manjusha) can also be found here. The prices here are fixed, but you will get top-quality products that’ll last for years. The Khadi Bhavan across the road also has cloth that is purely organic and handwoven. Chandni Chowk has always been our favourite market when it comes to affordable shopping. From chanderi, net, silk, and printed cotton fabrics to cloth materials for menswear, Katra Neel market in Chandni Chowk stocks up on everything. You’ll be surprised by the vast variety of fabrics available here for upholsteries and curtains. Kinari Bazaar is another market in Chandni Chowk that sells lace materials, georgette, gotta patti work and also heavy zardosi fabrics for a bargain price. In the narrow lanes of Seelampur, you’ll find heaps of fabrics in all kinds of textures and prints. Denim, rayon, georgettes, corduroys, jute, lace, you’ll find it all at throwaway prices here. 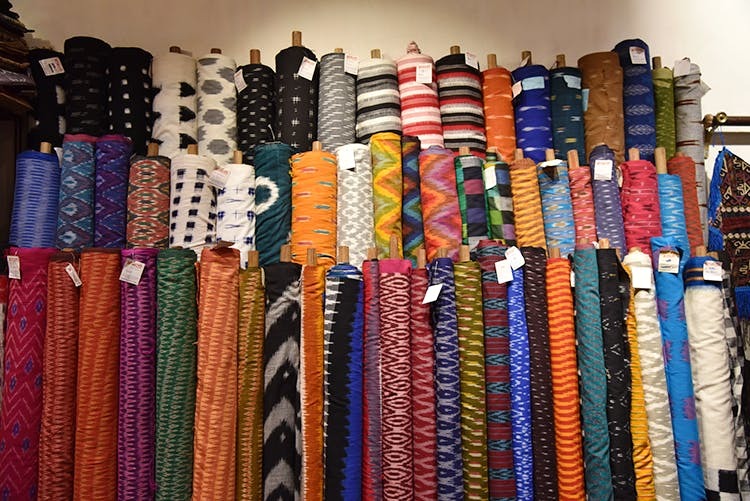 There are over 2,000 shops in Shanti Mohalla so finding the perfect material would not be very difficult as you have a lot many options to choose from. The task of browsing through this market might seem taxing but all the effort is totally worth it as you’ll discover great cloth materials. Timings: 10am – 7.30pm, closed on Mondays. Find more about this place here.